NRM members of Parliament inside the conference hall where they decided to back Museveni’s suspected wishes to run for office again in 2021. Photo by Beatrice Leni. 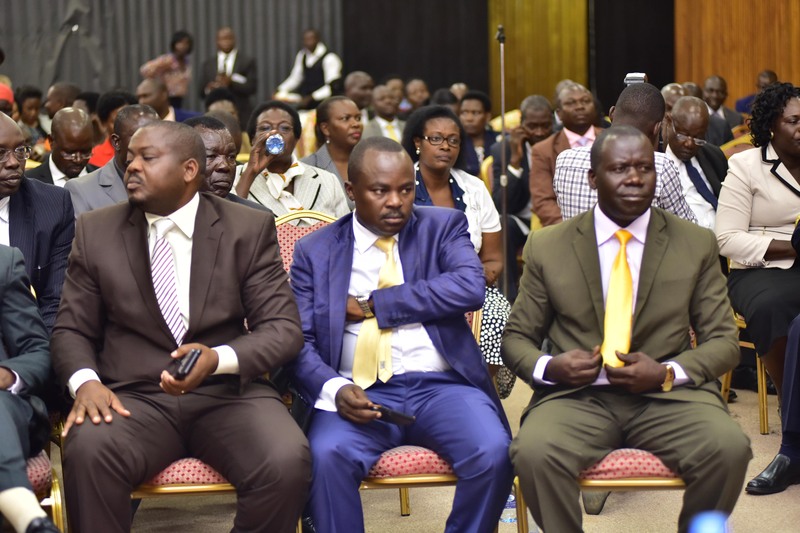 Members of Parliament from the ruling NRM party have endorsed a campaign to kick-start the amendment of Article 102 (b) of the Constitution to remove presidential age limits. At least 245 MPs gathered inside Parliament’s conference hall today, where they overwhelmingly agreed to back a motion seeking to move a private members’ bill, to, among other issues, amend Article 102 (b). The said constitutional provision, which provides that a person is not qualified for election as President of Uganda if he or she is less than 35 years and or more than 75 years of age. The meeting was chaired by Parliamentary commissioners Arinaitwe Rwakajara, Peter Ogwang and Robinah Nabbanja. Others who also co-chaired were Igara East MP Raphael Magyezi and Namutumba Woman MP Mariam Naigaga. In attendance were State Minister of Finance David Bahati, State Minister of Investment Evelyn Anite, State Minister of Water Ronald Kibuule and State Minister for Luweero Triangle Denis Galabuzi. Magyezi first presented what he said was a justification for the constitutional amendments through a private members’ bill, stating that the Supreme Court, in its March 31, 2017 ruling, observed that the late amendment of electoral laws has a negative effect on the conduct of elections. Magyezi opined that the law is discriminatory against Ugandans who are aged 75 and above, quoting Article 32 of the Constitution which prohibits discrimination based on age and other factors. He said there is no time yet Parliament has been waiting for the Executive to provide the amendments before the two years set by the Supreme Court to amend electoral laws elapses. The legislators have now given the Executive one week to present its own amendments or the MPs table a motion seeking leave to draft the private member’s bill. “The 10th Parliament is in its second year and we realised there is no time. We as MPs have waited for the Executive to do this and we are surprised that they are not ready to do it. The Constitution gives us that mandate to bring amendments to the Constitution,” Magyezi later said while addressing journalists at Parliament. “We need to amend the Constitution to allow any registered voter who qualifies to be an MP to stand for election as President. That allows even the youths and elderly so long as the people can elect and choose you”. Defence Minister Adolf Mwesige and others had argued that a private members’ bill was crucial because MPs are representatives of the people. “The Constitution gives any member the right to move a bill and also tasks the Attorney General to give the MP all technical assistance required to make sure that the bill is in accordance with the law,” Mwesige said. Kyaka South MP Jackson Kafuuzi at that point shot up and moved that a motion seeking leave to introduce the private member’s bill is tabled on Thursday this week. “What makes a Constitution a good Constitution is to make it a living thing. It should be able to grow with the people and change with the times and should be flexible,” Kafuuzi said. Kumi Woman MP Monica Amoding not amused by manner in which they were whipped to support the proposed age limit and other amendments. Net picture. There was some drama when Kumi Woman MP, Monica Amoding protested the ongoing discussions, stating that she was invited to discuss the Constitution Amendment Bill tabled by government last month, seeking to amend Article 26 of the Constitution. This bill deals with an equally contentious matter involving the government’s compulsory acquisition of land for public works prior to adequate compensation being paid to a private property owner. However, majority of her colleagues heckled the member from Kumi down, while others demanded that she sit down, accusing her of only seeking media attention. 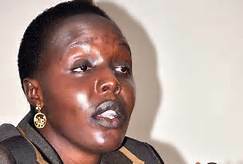 Amoding, however, claimed that she was made to sign forms but was not aware whether it was to support age limit amendments. She insisted that the matter required public consultation first. “My signature is on those forms and I believe that caucus discussions are fundamental in our political careers. Was this a caucus meeting?” she said. “If it is a consultative meeting, what was the objective? I am not seconding this proposal and I must remove my signature,” Amoding said, to which MPs booed her further, forcing her to leave. Some others like Manjiya MP John Baptist Nambeshe and Kassanda South MP, Patrick Nsamba said they would not be party to their colleagues’ resolutions and walked out of the meeting. “This was an ambush and when I stood up to protest, they refused to allow me to speak. It was at that point that I decided to walk out of the meeting. I cannot be party to these amendments,” Nambeshe told PML Daily. The issue of removal of age limit has attracted debate across the country, with its proponents pushing for it in a bid to extend President Museveni’s over 30-years in power. Those opposed to it, however, believe that the Constitution should be respected and President Museveni must retire in 2021, when he will have clocked 76, above the current constitutional cap of 75. Other amendments being mooted include amendments to Article 108 in respect to the qualification of Vice President to match that of the President; removal of the age limits of 35 to 75 for persons who wish to stand for chairperson of districts. Also included is amendment of Article 104 to change the time for filing and determination of presidential election petitions from 21 to 60 days.